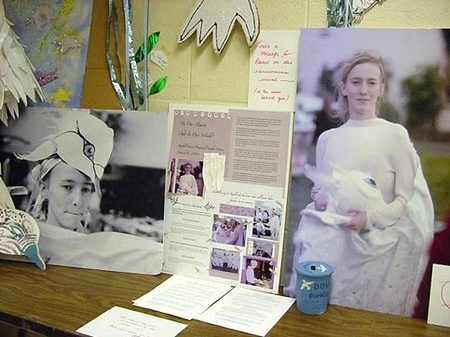 Rachel Corrie, a lifelong Olympia resident, Evergreen student and community activist was killed by an Israeli bulldozer in Rafah, Gaza, on March 16, 2003, while defending the home of a Palestinian family against unlawful demolition. This [$2,000] scholarship is for students dedicated to gaining a better understanding of the Middle East and to working locally or internationally to further Middle East peace. Applicants must show how they will use their studies to promote human rights and social justice through community activism and/or political advocacy. Areas of interest related to the Middle East may include: Arab culture and Arabic language, US Policy in the Middle East, and peace, justice and conflict resolution studies. There has been some speculation about the faculty members who encouraged her and perhaps approved her “independent study.” Simona Sharoni, who called Rachel her “beloved student and friend,” and Steve Niva, who “met with Rachel Corrie before she left for Gaza,” appear to have been among them. …struggled to reconcile my grief, frustration and anger with the empathy, love and compassion I felt for people who put their bodies on the line to resist oppression. I could find no expression of empathy, love or compassion in her writing for the Jewish victims of Palestinian terror, except insofar as she sees them as misguided. Indeed, she criticizes left-wing Israelis who are involved in dialogue with Palestinians because they don’t sufficiently understand that the needs of the occupied Palestinians take priority over those of the Jewish occupiers, even leftist anti-occupation types. Fall/Winter 2013-14: Alternatives to Capitalist Globalization. This program will explore and critically analyze the diverse social movements and alternative visions for creating more just global and national institutions and societies. Spring, 2013: Beyond Protest: New Theories and Practices of Political Action. This program will explore the theory and practice of new forms of oppositional political action that go beyond familiar modes of public protest. Both Sharoni and Niva are mentioned several times in Rachel Corrie’s Journals, and clearly they were important in her decision to go to Gaza. 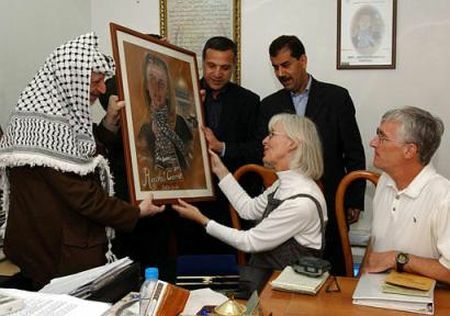 The radical community in Olympia/Evergreen has beatified Rachel Corrie while demonizing Israel; Rachel is not the only one who bought the Palestinian story hook, line and sinker. Doubtless those adult mentors believe that they are free of guilt for her death. They are not. Rachel Corrie’s Journals mentions a “Joe F.” who was her Arabic teacher — there is a Joe Fahoum teaching Arabic at Evergreen — who, according to a footnote (provided by the family), urged her not to go to Gaza. Possibly he understood the real nature and objectives of the ISM and the danger Rachel would be in, and unlike the others, cared enough to see her as a young woman with a future rather than as a pawn to be sacrificed in the war against the Jewish state. Before and after Corrie’s death. Different bulldozers, different time of day. Here are three examples of what is either utter incompetence, deliberately slanted reporting, or both. I’m going for ‘both’. This morning’s news mentioned that France was preparing to open a homicide inquiry into the death of Original Terrorist Yasser Arafat, based on the allegations of his porcine widow Suha that he was poisoned by Polonium 210. Simple arithmetic proves that even if there had been an impossibly large amount of Polonium 210 in Arafat’s underwear that Suha tenderly saved for 8 years, it would be undetectable today. Anyway, his symptoms were not consistent with polonium poisoning. Yet the New York Times and NPR report this insanity with a straight face! Rachel Corrie was crushed by an Israeli military bulldozer as she stood trying to block the demolition of Palestinian homes, in Rafah, Gaza. Today, a panel of judges ruled that she could have saved herself by moving out of the way. And they dismissed her family’s lawsuit against the government. In a document released by the court, the Haifa district court judges said that they found no negligence on the part of the army of the State of Israel. The judges called Corrie’s death a regrettable accident, and noted that she had ignored repeated warnings to leave the area. Cindy Corrie, Rachel’s mother, said she was saddened by the verdict and the seeming impunity of the Israeli military. The family averred that Rachel was clearly visible to the driver of the bulldozer, in her bright orange vest and loudspeaker. Corrie’s family fought a nine-year battle in Israel’s courts, arguing that the military never launched a full and credible investigation into the case. The Corrie family lawyer said they would appeal the case to Israel’s Supreme Court. First, Corrie wasn’t ‘crushed’. The court established, based on testimony from other ‘activists’ as well as IDF personnel, that she became entangled in a pile of dirt that the bulldozer was pushing, and probably died after her head was struck by a piece of concrete. Yes, she’s still dead, but the emotional content of ‘crushed’ is much greater. Second, she wasn’t trying to “block the demolition of Palestinian homes.” The bulldozer was clearing debris in a place where numerous tunnels used to smuggle weapons and explosives across the Egyptian border to terrorists in Gaza were located. Many of the ‘homes’ nearby were covering tunnel exits. Third — and most important — the piece doesn’t mention that court very carefully examined the question of whether the bulldozer operator could have seen Corrie and concluded that he could not. It quotes the family’s contention that she was holding a bullhorn and in plain view, but this is based on a deliberate photographic fraud. Eyewitnesses said that she was immediately in front of the bulldozer’s blade where she could not be seen when she was hit (see yesterday’s post for a summary of the court’s decision). One would think that a reporter on the scene would be able to do better with the simple facts. The piece also employs the usual NPR technique of emphasizing the emotional content of the anti-Israel side and barely mentioning opposing views. A couple of weeks ago, an anti-Israel blogger copied a fanciful scenario about an Israeli cyberattack on Iran from a discussion forum, and claimed it was an actual war plan ‘leaked’ to him by an Israeli official. He managed to fool a few media outlets with it, even the BBC. It was quickly debunked (see also here and here). But guess who picked it up this week? Apparently NPR’s reporter Tom Gjelten found it too delicious to ignore, despite the fact that it was 100% bull pucky. Do they ever check this stuff? The incident happened in a place that was a “site of daily warfare,” which civilians were forbidden to enter. The bulldozer was “leveling the ground and clearing it of brush in order to expose hiding places used by terrorists, who would sneak out from these areas and place explosive devices with the intent of harming IDF soldiers,” and not destroying Palestinian homes. The IDF tried to distance the activists from the bulldozer, warning them, exploding stun grenades and firing warning shots, but they did not comply. Corrie was not visible to the driver (see here and here). I thank God that my son survived, that the bullets, grenades and mortar shells that were deliberately aimed at him missed. Other Israelis, soldiers and civilians, were not so lucky. You’ve worked hard to place blame on Israel and the IDF for your daughter’s death. That’s understandable, because if Israel wasn’t responsible, who was? I can only suppose that you struggle to keep from blaming yourselves. It felt a little unnerving … At first we hoped it wouldn’t happen. But Rachel was 23 years old, and was very much making her own decisions, as we thought she should. We had always supported our kids in whatever steps they wanted to take. Some people say: ‘Why did you let her go?’ That was not ever something I felt was my role. You’re right. I didn’t tell my son not to do what he did, either. The decedent put herself in a dangerous situation. She stood in front of a large bulldozer in a location where the bulldozer’s operator could not see her. Even when she saw the pile of dirt moving towards her and endangering her, she did not remove herself from the situation, as any reasonable person would have. But if I had to blame someone for making this terrible event happen, it would not be the bulldozer operator, the IDF or Israel, which is in a life-and-death struggle with its enemies. I would blame the ISM, which specializes in brainwashing Western young people, sending them into a war zone and placing them in harm’s way — in full knowledge that the Palestinian cause will benefit if one of them is injured or killed. Rachel made a choice and took a side in a conflict that she did not fully understand. She had a right to do that, but to a certain extent she was manipulated and exploited. She chose the wrong side, and she paid a terrible price. You have chosen to honor her memory by taking her side. As I said, it’s understandable, but it doesn’t validate the ideology that got her killed in order to further its goals of still more death and destruction. I don’t think I’ve ever published a poem before. This one was sent to me by Shalom Freedman, who, in addition to being a frequent commenter on this blog, has written several books on Jewish and moral subjects as well as poetry, reviews, etc. For our having such contemptible creatures among us.